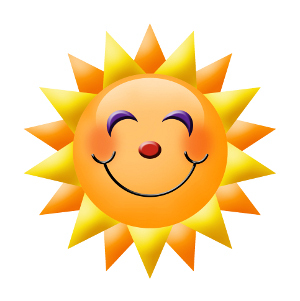 Sunlight - "You are my sunshine, my only sunshine..."
All plants require sunlight. Some, as plants have done for millennia, have adapted to lower light requirements in order to survive, but they all need at least some light to survive. One of the more confusing items for beginning gardeners is the subject of plant light requirements. Plants and seeds come with light requirements listed on the label. While these are general guidelines, they don't specify just how many hours of enter into the equation. Also, some plants that are listed as "full" sunlight will do OK in less than full sunlight. For example, we have a bed on the north side of the house. It also has a large redbud tree in it and large oak trees to the south and west. Some sun-loving black-eyed susans (Rudbeckia) started growing amongst the sweet woodruff (Galium odoratum) some years ago and are doing fine, even to the point of crowding out the shade-loving woodruff. They just don't get as large as they would in full sun. Full sun Six or more hours of direct sunlight. Light shade Six hours of direct or lightly dappled sunlight. Partial shade Four to six hours of direct or moderately dappled sunlight. Full shade Less than four hours of direct or heavily dappled sunlight. Dappled is defined as having patchy or spotty color. For our purposes, dappled means filtered thru overhead leaves. There are also certain conditions at different times of the year that affect the amount of light your garden plants will recieve. If you have areas shaded by deciduous trees, then you can plant bulbs that bloom in the early spring before the leaves come out such as daffodils and hyacinths. Areas with morning sun and afternoon shade will be good for most plants. Morning shade and afternoon sun is not as good for plants that like partial shade. The areas will be slow to warm and the heat of the afternoon will stress plants more than the morning sun. The best thing to do is to observe the sun/shade patterns of your gardens throughout the season and day. Keep notes on when the sun reaches an area and how long it lasts. Another common mistake to watch for is planting tall plants in front of smaller ones. This is a mistake we've made, especially in the spring before the oak trees that shade our back yard have leafed out. A relatively new tool for checking growing conditions is the Easybloom plant sensor. This easy to use tool is placed in your garden and keeps track of growing conditions at the plant level for 24 hours. The Easybloom is then connected to your computer with a USB connection and the data is analyzed and recommendations are given. And don't be afraid to experiment. Some plants are more tolerant of shade than others. Impatiens will do fine in any light. Some hostas will do ok in full sunlight and some won't. We have a small bed up by the road that has Stella D'oro daylilies surrounding Purple Coneflowers. The bed gets an hour or two in the morning and an hour or two in the late afternoon. The daylilies do great, but the coneflowers not so great. We will probably move the cone flowers someplace else and try something else in their place this year.